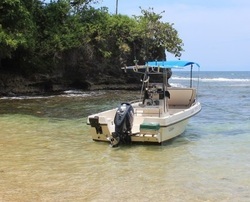 Are you ready to embark on a fishing trip in Puerto Viejo? The Southern Caribbean is characterized by the largest reef system in Costa Rica and has deep water 2-4 miles offshore. This provides unique experiences for fishing for a variety of species using a variety of techniques. The sea offers seasonal and yearlong catches. Spanish Mackerel, King Mackerel, Barracuda, Tarpon, are commonplace. Several species of Snapper and Jacks, Tuna and Wahoo are often favored by fishermen. Weather and sea permitting, jump in for snorkeling and lobster! If renting a boat for a half or a full day, maximize your experience in the 20′ center console walk-around boat. It’s equipped with a 150 hp Evinrude, depth finder, GPS, CB radio and live bait well. Enjoy the comfort and safety provided by shade awning and PFDs. All rods, reels, bait, lures, mask and fins, and ice chests provided on the boat. Half-day tours include cold drinks and snacks. Full-day tours also include lunch – which is hopefully your catch cooked on an isolated beach! If you like to fish like the locals do, then we offer the artisanal fishing in a traditional Panga style boat. 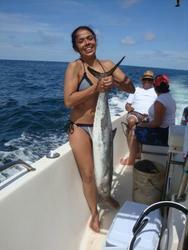 You will get the chance to fish Mackerel, Snapper, Jack or even Tuna. Our local Captain knows all the best spots and will prepare you a delicious lunch with your catch of the day. 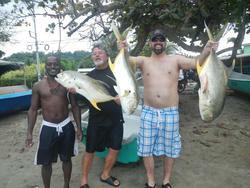 There’s no better fishing trip in Puerto Viejo. The artisanal and fishing with the Captain option are per person and price varies depending on how many persons go. Includes: A typical 1/2 day tour includes a cooler stocked with hard-boiled eggs, fresh cut fruit, boxed juices, hummus and pita bread, crackers, cookies, peanuts, beer and an igloo of water to refill their own water bottles. Typically on a full day tour, the same cooler accompanies us but we also cook the morning’s catch on the beach at noon for the clients, BUT this is very dependent on flat seas to get into a little secluded cove.